For all the guitar enthusiasts out there, stay tuned for the upcoming Singapore Guitar Show (sorry about the pun)! It is the first ever exhibition ever in South East Asia dedicated to the appreciation of fine guitars and the art of building these amazing instruments. 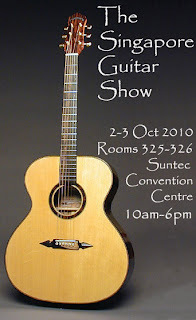 Organised by on-line guitar magazine Guitarbench.com, the Singapore Guitar Show is an opportunity to witness some beautiful hand-crafted guitars by artisans from USA, Australia, New Zealand as well as Singapore. There will also be workshops, demonstrations and live performances to inspire the budding guitar heroes. Even though most of the guitars are high-end pieces, there will be plenty for kids and families to enjoy. G'day, my hubby & son were so excited when I showed this to them...until I went to the guitarbench.com website where it said no entry to this event for kids 10 years and under! Hi anonymous- I have just been in touch with the organisers of the Guitar Show and they assured me that children are welcome. They only ask that children under 14 years be accompanied by a responsible adult. So enjoy the show!